Is this the best ever Sarah Kerrigan cosplay you've ever seen? 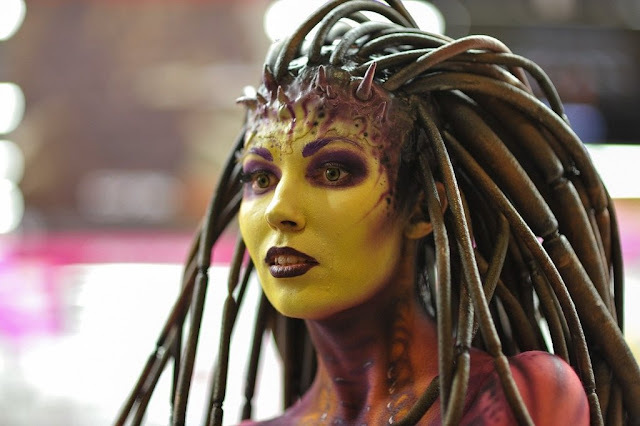 During a promotional event for Starcraft II's Heart of the Swarm this wonderful cosplay version of Sarah Kerrigan turned up to get her hands on a deluxe edition of some kind. Pay attention to the detail, it's simply phenomenal. The make up and body paint is very well done. This costume must have taken many many hours to plan and apply. I think this is probably the best Kerrigan cosplay that's done the rounds! Queen of Blades indeed. Who's excited for the new Xbox reveal? Who knew the Master Chief originally had a sword? Will Destiny include competitive multiplayer? I want to know what video game it is!? Who is the Queen of the Reef in Destiny? What are the Exo in Bungie's Destiny?